One of the well-known caveats of the total variation denoising model of Rudin, Osher, and Fatemi is the "staircasing" phenomena. This is an artifact that forms at regions of moderate gradient in the image, turning them into approximately piecewise constant regions separated by spurious edges. As proposed by Chambolle and Lions, one way to abate staircasing is via inclusion of higher order terms in the variational model. The resulting model can be solved via convex duality. 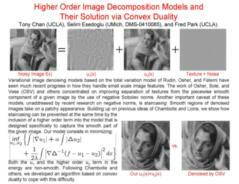 Chan, T. F.; Esedoglu, S.; Park, F. Image decomposition combining staircase reduction and texture extraction. Journal of Visual Communication and Image Representation. 18:6 (2007), pp. 464-486.